Pipeline engineers, operators, and plant managers are responsible for the safety of pipelines, facilities, and staying on top of regulatory compliance and maintenance. However, they frequently need reference materials to support their decision, and many new pipeline engineers and plant managers are responsible for major repairs and decisions yet do not have the proper reference to set a holistic integrity plan in place. 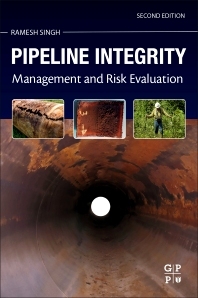 Pipeline Integrity, 2nd Edition delivers necessary pipeline inspection methods, identification of hazard mechanisms, risk and consequence evaluations, and repair strategies. Covering relevant standards and processes for risk, assessment, and integrity management, this go-to reference provides the principles that guide these concepts enhanced with more critical regulatory information and easier organization betwen liquid and gas pipelines. More detailed information is provided on asset reliability, including risk-based inspection and other inspection prioritizing tools such as value-driven maintenance and evidence-based asset management. Pipeline Integrity, 2nd Edition continues to provide engineers and plants managers a vital resource for keeping their pipelines and facilities safe and efficient.